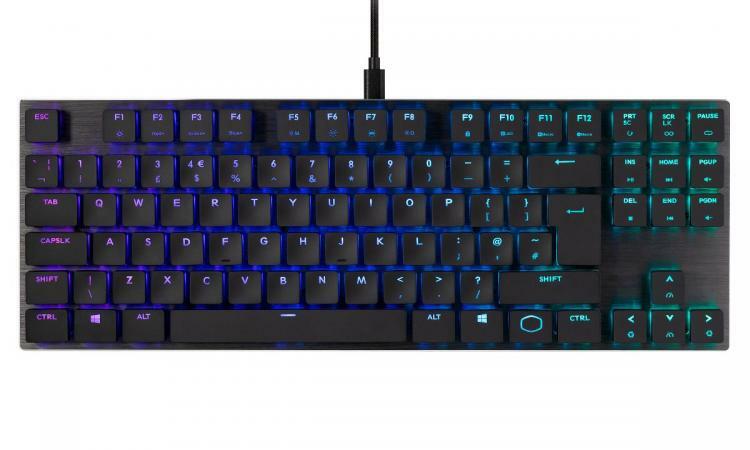 Earlier today Cooler Master unveiled new TK- and CK-Series tenkeyless keyboards for mainstream markets, but that's not the end of the surprises. Targeting users who prefer a more refined aesthetic (as well as an even more compact, sleek design), the SK series of mechanical keyboards incorporates a very low profile design that both looks the part and has the reliability to match. - Bryant Nguyen, Peripheral General Manager. The eyes of many potential owners will probably be initially drawn to the SK650. This design utilises a standard layout complete with numberpad, and so is ideal for a mix of uses in an office and at home. A brushed aluminium frame looks particularly appealing compared to common plastic designs, and should also serve to improve its overall rigidity. SK-series keyboards are equipped with Cherry MX Low Profile switches with per-key RGB LED lighting, configurable via Cooler Master's Portal Software App or in a pinch on the keyboard directly. Not only that, a comprehensive macro system allows further customisation of key inputs that's useful for both gaming and conventional workplace tasks. The SK650's sister design is the SK630, a tenkeyless variant which may be the preference of gamers in particular. 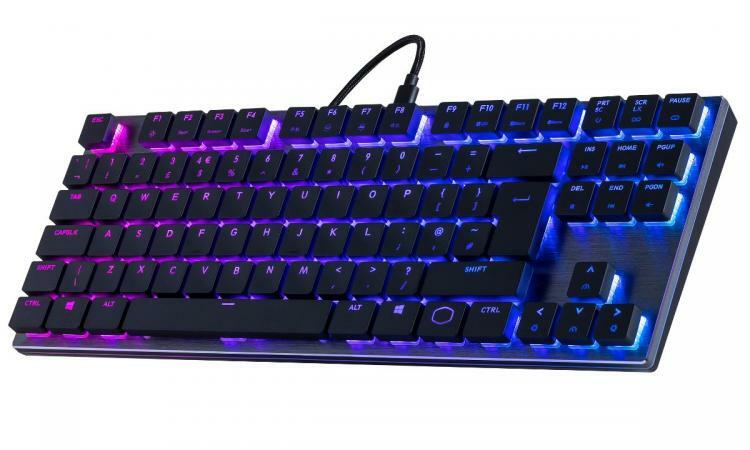 This keyboard is still equipped with Cherry MX Low Profile switches and configurable per-key RGB LED lighting, but an even more compact design makes it ideal for LAN events and other situations where desk space would be at a significant premium. Both the SK650 and SK630 connect via USB Type-C, and also feature Windows key on/off lock functionality. The key switches are Cherry MX Low Profile Red variants, with linear rather than tactile/clicky actuation. • On-the-Fly Controls - Make real-time adjustments to lighting and macros with no software necessary, including Windows Lock On/Off to prevent getting kicked out of the game when the Windows Key is accidently pressed. • Easy-to-use Software - Map 16.7 million colors to any key, customize lighting modes, or fine-tune macros through Cooler Master’s Portal Software Application. • Extra Flat Keycaps; Extra flat, extra square, and extra durable. • Removable Type-C USB Cable for easy transportation and future-proofing. • Hybrid Key Rollover with automatic switching between 6KRO and NKRO to ensure legacy compatibilty and that always every press is registered. 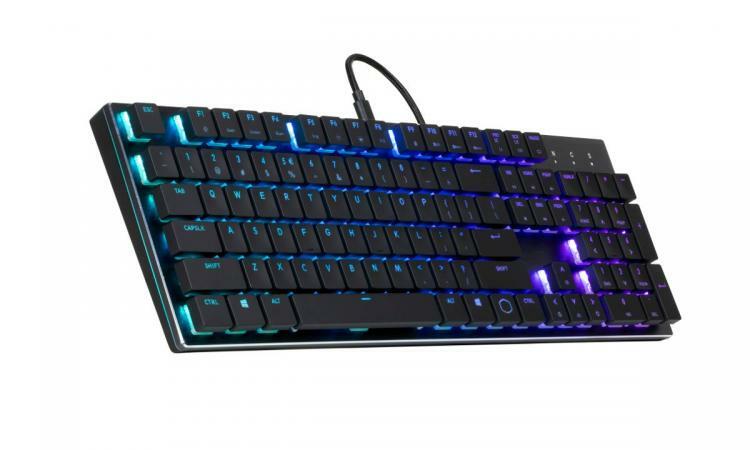 Looking ahead to March, Cooler Master will be launching the 65-key SK621, a keyboard with even more compact layout that connects wirelessly over Bluetooth rather than USB. Wireless versions of the SK650 and SK630 - the SK651 and SK631 - will also join the series for an extremely well-rounded range overall. Plus, these wireless models will be available in white or gunmetal grey liveries and as versions compatible with Android and iOS. The Cooler Master SK650 and SK630 can be pre-ordered in the UK today at the following links, priced at £159.99 and £119.99 inc. V.A.T. respectively.